Why Do I Have to Eat Off the Floor? Why can't I drive the car? Because you are too small to drive. Why can't I jump on the chair? Because chairs are for sitting. This work features illustrations which present these seemingly innocent questions, the kind usually addressed by a child to a parent, as being addressed t... read full description below. Why can't I drive the car? Because you are too small to drive. Why can't I jump on the chair? Because chairs are for sitting. 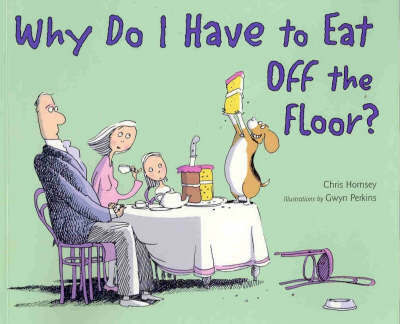 These seemingly innocent questions, the kind usually addressed by a child to a parent, take on a crazy new twist as the illustrations reveal that the questions are being addressed to a child - by her dog! The understated text beautifully sets off the grandiose ambitions of this little dog with BIG ideas. And his little girl owner patiently answers all his questions, until finally, she has to tell it like it is: But why do I have to eat off the floor? Because you're a DOG, Murphy! Quirky, charming and absolutely hilarious, Why Do I Have to Eat Off the Floor? will appeal to children, adults - and all those dog owners whose dogs just don't understand that they're not people! Gwyn Perkins's whimsical illustrations will delight.